We repair top-name 3D printers now in partnership with Becoming 3D. We’ve also got new consulting services for you. 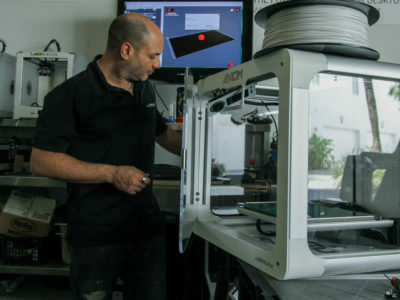 Lime Design offers 3D printer repair services in Fort Lauderdale, plus help with set-up, training, installation, upgrades and more. Rodrigo Lima, Founder & Creative Director of Lime Design configuring 3D Printer to Create Prototype. We’re excited to announce Lime Design’s new 3D repair services, in partnership with Becoming 3D. This along with our new consulting services are available now! As a 3D printer repair shop, we’ll be working on some of the industry’s most popular machines. We work with these printers all day as product developers, so we have deep, expert-level knowledge about how they work. Lime Design’s studio is in downtown Fort Lauderdale, Florida, so call or stop by to get your repair handled with our signature attention to detail and customer service. The news of our partnership with Becoming 3D comes at a great time. We also just refined our consulting services here at Lime. While we have always been available to discuss the best 3D print solutions for your needs, we’ve usually done it in the framework of larger product development. Now, when you’re doing your own due diligence, come to us for advice. We can help you with strategy, road maps and other recommendations to select the 3D print solution that’s best for your business or invention idea. Not sure where to start? Contact us to learn more about our 3D printer repair and consultation services!